This is my simple recipe for making fruit scones. It uses fewer ingredients than some recipes and can be made with the minimum number of utensils, especially if you have a set of electronic scales that can be zeroed between ingredients. Plate for holding the butter while it softens. Bowl for beating the egg. Cut 55g of lightly salted butter into cubes of less than 1cm and leave on a plate to soften. Set the oven to 220 degrees or gas mark 7. Beat the egg in a bowl with the milk. Measure 225g of self raising flour into a mixing bowl (this does not need to be sieved as it is going to be crumbed). Quickly rub the butter into the flour until the mixture resembles fine breadcrumbs. Add the 25g of caster sugar and stir in using a normal table knife. Make a well in the middle of the bowl and stir in the milk and egg mixture a little bit at a time until there is a smooth pliable dough. It is easy to add too much so go slowly. You will not need it all - the rest will be used later. The correct dough mix should be wet enough to hold together into one lump and come off the bowl, but not so wet it is sticky. Turn the mixture on to a floured chopping board and turn/shape smooth then lightly roll out to 2.5cm (1 inch) thick. Cut scones using a 7.5cm (2") pastry cutter. Place on the baking tray and brush with the the milk and egg mixture. Bake near the top of the hot oven for 15 minutes or until golden brown and well risen. This recipe will work fine with just milk and no egg, although it may not rise as much. 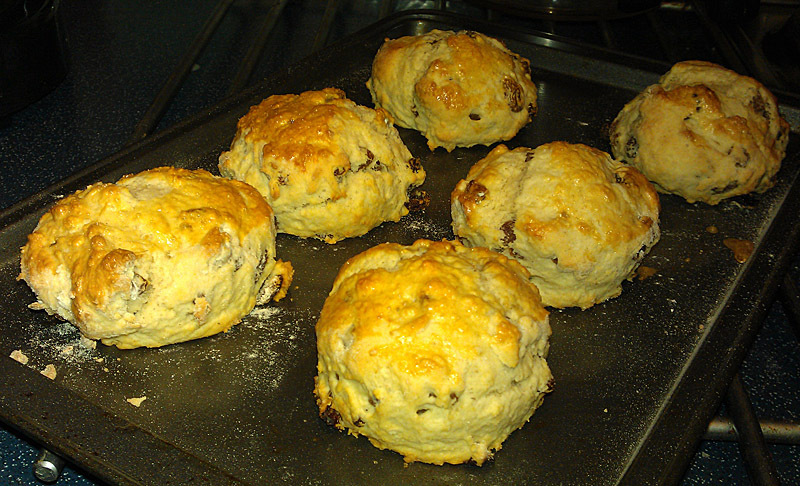 You can brush the top of the scones with milk instead of egg too. If you like this recipe you might like my simple fruit cake recipe which uses fewer utensils and makes less mess.